Some of us have been purchasing maroon shirts since Eli Whitney began sorting cotton. You know who YOU are. Just open the closet doors and you are flooded with attire sporting that deepest shade of crimson color. But on this particular Friday, the award for the oldest t-shirt design went to third grade teacher, Mrs. Blankenship. 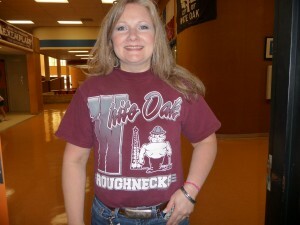 She wore one of her son’s old Roughneck t-shirts to show her support for our Roughneck football team. Just how old do you think this t-shirt might be? Mrs. Blankenship is certainly not an “oldie” but she is a “goodie”.